If $SPY can close above $147.24, just pennies above today’s close of $147.08, it will be its highest close since December 31st, 2007. Assuming there are 252 trading days per year, this would equal a 1267 day new high. What has happened in the past when $SPY was making similar new highs? On Thursday, March 15th, the S&P 500 made a new 900 day high. With the S&P 500 re-visiting prices it hasn’t seen in almost 5 years, I thought it would be interesting to look at what happens after the index makes significant new highs. Sell SPY at the close Y days later. No commissions or slippage included. All SPY history used. Because the market was making significant new highs in October of 2007, the results show the impact of the bear market, starting around day 65. As the trades are being held for 100 days, any trade initiated in October 2007 was held through the beginning of 2008. Ouch. On the brighter side, a new high of 50 days or greater has seen a surge during the last 25 days of the holding period. This surge appears to be the relatively normal result of buying during a bull market. It should be noted that a new 900 day high generated the highest return. Sample size grew as the X day new high number decreased. 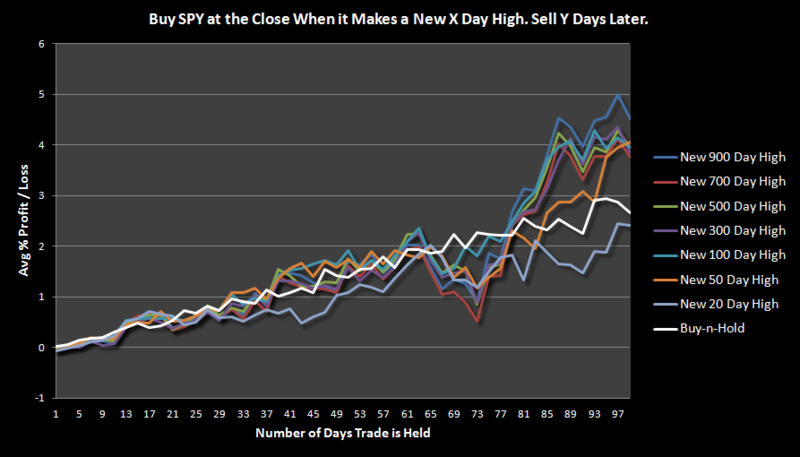 The Buy-n-Hold return was calculated by chopping SPY performance into 100 day segments and then averaging those segments. The bottom line is that save for a new Armageddon a la 2008, the market has tended to keep climbing after making a significant new high. ¹ This study does not show the conclusion of the trade that was initiated on March 15th. After 100 days, the March 15th trade was .2% lower. This will bring down the New 900 Day High average trade reflected in the graph. Pretty neat stuff. This is with price-only data, correct? I believe the dividend adjusted S&P has already made a new all-time high. Did you look at S&P data going back further, say into the ’80s? That might provide a better distribution of bull vs bear periods. The data I’m using is dividend adjusted. You might be thinking of the total return indices, which have dividends included? You are correct, though. I should run the test with my $SPX data, which goes back over 100 years.